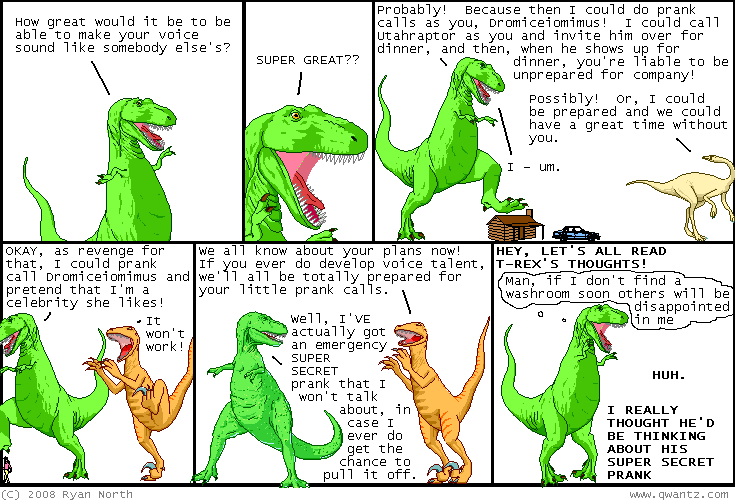 Dinosaur Comics - November 5th, 2008 - awesome fun times! –You know what everyone knows we're doing just because it's a photo? SMILING. November 5th, 2008: I went to Chris's launch and book signing party for the new Achewood book, The Great Outdoor Fight and it was fun times. Achewood is my favourite comic and it was great to meet the man behind it! He is a man of strong handshakes and good taste in wine. Just now as I was linking to Amazon's page for Chris's book, I saw they've got a deal where you can buy Chris's Achewood book and Nick's PBF book and my Dinosaur Comics book together and save money, which is a good idea! I approve of this automatically-generated discount, Amazon.com robot overlords. Also: Americans: hooray for your election! I am excited for your new president. Thank you for choosing the one you did. One year ago today: custom can mean "conventional" (its our custom), but also "unique" (a custom suit)! custom, you can come to MY dinner parties anytime.